Women who want to get more engaged in state policy can start by connecting with local resources and organizations that are dedicated to increasing women’s participation. Click here to learn more about why these type of “institutional resources” are important to breaking down barriers to women’s political participation. We created the following list of Georgia-based organizations to help connect women with an array of resources, from programs that support women running for elected office to trainings that empower women to become more involved in state policy advocacy. Visit their websites to learn more about the resources and programs they offer, to sign up for their e-newsletters, to see their policy agendas, or to attend their lobby days and other advocacy-related events. Check this site often for updates on new resources that are being offered by local organizations, highlights of the work that these organizations are doing, and announcements when national organizations are hosting events in Georgia! 9to5 Georgia 9to5 is one of the largest, most respected national membership organizations of working women in the U.S., dedicated to putting working women’s issues on the public agenda. 9to5 Georgia leads the Georgia Job/Family Collaborative, a statewide coalition supporting flexible workplace policies. The organization hosts trainings, workshops, events and advocacy days throughout the year. 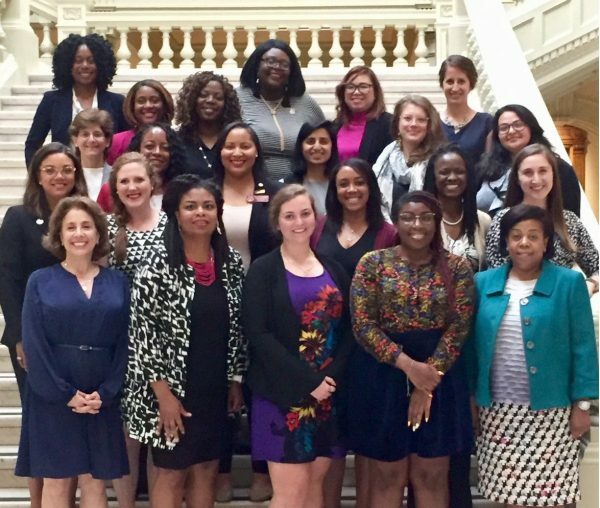 Capitol Women Founded by Georgia State Representative Erica Thomas, Capitol Women is a leadership development platform for women passionate about serving and leading in politics. This training is not limited to potential women candidates, but is also for women who will be leaders in changing the political landscape throughout our nation. Feminist Women’s Health Center The Feminist Women’s Health Center offers community education, grassroots organizing, public affairs and advocacy programs to advance reproductive health, rights, and justice. For example, their Feminist Action Network email alerts help people get involved in state or federal advocacy, volunteers can join their Legislative Advocacy Committee, and women can participate in their advocacy days at the State Capitol during the legislative session. For more in-depth engagement, the organization offers the Errin J. Vuley Fellows Program, a 10-month leadership development program in reproductive, gender and racial justice that begins each spring. Georgia Commission on Women The Georgia Commission on Women has been the voice of Georgia women in government since 1992. The Georgia General Assembly created the GCW to improve the lives of women in our state. Fifteen Georgians make up the Commission, and the Governor, Lieutenant Governor, and Speaker of the House nominate them for four-year terms. The members, appointed from all regions of the state, are devoted to the health, education, employment, and legal status of women in Georgia. Georgia PATH Program Developed by State Representative Dar’shun Kendrick of the Kendrick Advisory & Advocacy Group, the Georgia PATH [Providing Access to the Halls] Program is a 7-month training program that exposes adult women and minorities in Georgia to governmental affairs or “lobbying” careers. This is specifically for those who do NOT want to run for office, but who want to advocate for a cause more than part-time. The program includes mentorship from professional lobbyists. Applications open in the fall. Georgia’s WIN List Georgia’s WIN List is a political action committee dedicated to recruit, train, support, elect and re-elect Democratic women for statewide and legislative office who will be effective advocates for the issues most important to women and families, including the preservation of reproductive freedom. During our 18 year history, we have helped elect more than 60 women to the Georgia General Assembly, 34 of whom still serve. The organization offers a year-long program, the WIN Leadership Academy, to train women to run for office and work on campaigns. Junior League of Atlanta The Junior League of Atlanta, Inc. (JLA) is an organization of women committed to promoting voluntarism, developing the potential of women, and improving the community through the effective action and leadership of trained volunteers. The JLA advocates for policies in three focus areas: early childhood education, commercial sexual exploitation, and generational poverty. The JLA Leadership Institute provides opportunities for members to build their capacity as civic leaders and includes a certificate course in Advocacy. League of Women Voters of Georgia The League of Women Voters is a nonpartisan political organization that envisions a democracy where every person has the desire, the right, the knowledge and the confidence to participate. The organization believes in the power of women to create a more perfect democracy. Check out their 2018 Georgia Voter Guide. NewPowerPAC NewPowerPAC, a Georgia women’s political action committee, directly addresses the absence of women in Georgia politics by recruiting, training, endorsing and financially supporting women candidates for elected offices throughout Georgia. With the help of NewPowerPAC, Georgia is one of only a handful of states with the institutional resources crucial to electing women to office. of Georgia The National Women’s Political Caucus is a multicultural, inter-generational, and multi-issue grassroots organization dedicated to increasing women’s participation in the political process and creating a true women’s political power base to achieve equality for all women. State chapters provide support to candidates running for all levels of office by helping raise money and providing crucial hands-on volunteer assistance. SPARK Reproductive Justice Now offers advocacy and issue-based education through their Speak Justice Take Action (SJTA) programming. SJTA is led on the principle that civic engagement combined with community mobilization is vital to making and sustaining lasting change in our communities. The SJTA program includes informing legislators of key reproductive justice issues, legislative hearings, an annual statewide day of action and advocacy training. The following are women-focused organizations that offer a variety of capacity-building initiatives and ways for women to make their voices heard! American Association of University Women of Georgia Through com­mu­nity lead­er­ship and col­lab­o­ra­tion, AAUW of Geor­gia improves equity, access, and oppor­tu­nity for women and girls. AAUW of GA empowers women and girls and pro­vides a forum for their voices to be heard. Georgia Association of Black Women Attorneys The Georgia Association of Black Women Attorneys (GABWA), is a statewide organization founded in 1981 by a group of African American women to 1) focus on women and children’s issues, 2) increase black female representation in the judiciary and public offices, and 3) take a proactive stance on political issues. The Decatur-Dekalb chapter advocates on behalf of women and girls, offers a Professional Development Academy for members, and supports members in attaining judicial and public offices. Georgia Association of Women Lawyers Founded in 1928, the Georgia Association for Women Lawyers (GAWL) serves the diverse interests of women lawyers in Georgia. GAWL has a strong, bipartisan voice on issues such as the judicial nomination process, legislative affairs, work-life balance issues, and the education, training, and sponsorship of women lawyers to take their rightful place as leaders in the state of Georgia. GAWL offers members business and leadership training opportunities, mentoring circles and affinity groups. Georgia Alliance for Social Justice Georgia Alliance for Social Justice – the official Georgia affiliate of the Women’s March – works to mobilize collective action to create change at the local, state and federal levels. Georgia WAND Georgia WAND Education Fund, Inc. is an independent, grassroots, women-led organization that organizes front-line communities, especially people of color, women, and youth, to establish long-term solutions for social justice. Georgia Women (and Those Who Stand with Us) Georgia Women is a non-partisan, grassroots social welfare organization – founded in Macon – whose purpose is to raise a common voice about issues important to women and our country. National Asian Pacific American Women’s Forum The National Asian Pacific American Women’s Forum (NAPAWF) is building a movement to advance social justice and human rights for Asian American and Pacific Islander women and girls. With an office in Atlanta, NAPAWF focuses on reproductive health, economic justice and immigrant rights. National Coalition of 100 Black Women – Dekalb The National Coalition of 100 Black Women is a nonprofit organization comprised of over 3,000 members in 62 chapters across the country. The Decatur-Dekalb Chapter was founded in 1989 and advocates on behalf of black women and girls to promote leadership development and gender equity in the areas of health, education and economic empowerment. The chapter offers members mentoring programs and helps members understand their roles as community leaders and advocates. Women Engaged Women Engaged is a social justice nonprofit that takes an innovative, hands-on learning approach to advancing women’s human rights, youth empowerment and civic engagement efforts in Georgia. Using a human rights framework, Women Engaged develops policy recommendations, conducts research and organizing initiatives paired with, leadership development, savvy communications outreach strategies and civic engagement opportunities for women and youth of color. WE Vote. WE Rise! is their year-round integrated voter engagement program. *Want to add a resource or provide an update to this information? Email [email protected]. Disclaimer: These links are being provided as a convenience and for informational purposes only; they do not constitute an endorsement or an approval by the YWCA of Greater Atlanta of any of the products, services or opinions of the corporation or organization or individual. The YWCA of Greater Atlanta bears no responsibility for the accuracy, legality or content of the external site or for that of subsequent links. Contact the external site for answers to questions regarding its content.